New Horizons Minnesota is a premier training provider. And, with award-winning instructors and extensive selection of vendor-authorized training and certifications from top technology providers such as Adobe, Cisco, Citrix, Microsoft and VMware, we are able to provide the highest standard in training. New Horizons Minnesota is the leading provider of IT, Desktop Applications, Project Management and Business Skills training courses. As a training provider for many of the industry's top vendors, such as Microsoft, VMware and Cisco, we are positioned to offer the latest authorized classes delivered by certified instructors to keep you on the cutting edge of information technology. 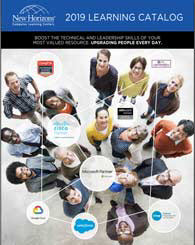 Download the 2019 Learning Catalog for descriptions of full course offerings, certification information and more! Then download the schedule for New Horizons Minnesota courses here.